Jerry Winthrop roared with laughter when the director of a career academy asked him if the programs will be protected in the event that California’s revenues fall short and the state pulls the trigger on education funding at the end of the year. Winthrop, who oversees more than 400 California Partnership Academies, told the 25 academy coordinators and teachers gathered at an Oakland High School last week that they may want to learn how to write grant proposals. Jack Aiello, who asked the question, didn’t intentionally make a joke. His Electronics Academy at Independence High School in San Jose’s East Side Union High School District is about 20 years old. Aiello wants to see it reach 21. In normal times, the school only had to submit an annual report and it was pretty much guaranteed continued funding as long as it met all the state requirements. In these uncertain financial days, however, there’s no sure thing, not even for the tried and true. The academy has a 95% graduation rate (15 to 20 percentage points higher than the rest of the school), boasts strong attendance, and sends a large group of students to community and four-year colleges. But recently Aiello has been finding it difficult to do things exactly the way the State Department of Education wants them done, and that makes him a little tense. “There are so many stresses on budgets and trying to make everyone happy that it’s hard to follow all the rules exactly the way they’re supposed to be followed,” he said. For example, students in California Partnership Academies are supposed to be in the same classes together so they can form a bond among themselves and with their teachers. But when an academy class in a core subject, like English, math, science, or history, has an unfilled seat or two, Independence High has been placing non-academy students in it. That could cost the program its state funding. Winthrop is tall and imposing and, having started three academies during his teaching days, is arguably one of a handful of CDE staff who can hold court on California Partnership Academies. That’s what he did at Oakland’s Media Academy High School last Friday, running through a PowerPoint presentation and fielding questions on what to expect in state funding for next year. The answer: Don’t get your hopes up. As we reported here last week, a new report from UC Berkeley’s Career Academy Support Network gave academies high marks, particularly for improving graduation and college-going rates for students considered at risk of dropping out of school. At the same time, two major sources of funding for academies are drying up within a year, putting about 200 in jeopardy. So it was natural that most questions from academy directors focused on other places to seek funding, and the chances that they’ll be able to get a slice of a new, but small, state academy grant program for next year. To my right, Ryan Cheshire had just started a multimedia animation and videogame design academy at Encinal High School in Alameda with a seed grant from the CDE. He said they knew the program was sun-setting at the end of this academic year, but hoped the legislature would step in and extend the program. “One year is just not enough time. It’s a complex program, there are so many different parts to it that at one year, you’re just scratching the surface of being effective,” said Cheshire. As it turns out, there is one new state source of funding; it’s just so small that the competition is expected to be fierce. grants over five years, to support up to 100 clean technology and renewable energy partnership academies, with the money coming from the Renewable Resource Trust Fund and paid for by a small surcharge on utility bills from. Republicans insisted that the funds come from Proposition 98 general funds for education. So the program now has a little over $3 million for the first round of grants and no guarantee that the remaining $37 million will be available. Instead of nearly 100 academies, the amended law will now pay for about 21 grants. Nevertheless, Winthrop expects hundreds of schools to apply. Another bill, SB 70, fades out at the end of this school year, but Sen. Steinberg said he is already in talks to try to refund it. 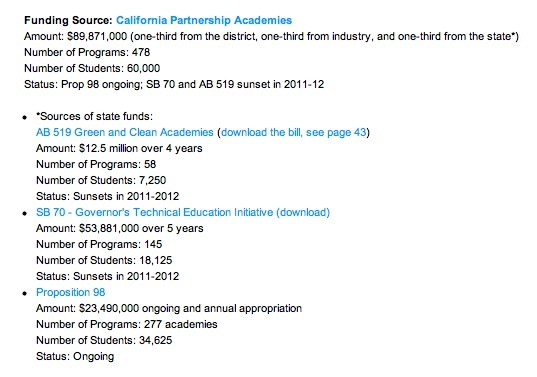 California first passed legislation for partnership academies in 1984, providing money for 10 pilot programs. Three years later, a second bill added forty more academies. Those funds have been renewed over and over since then. That’s how Aiello’s academy continues to operate, and where Oakland’s Media Academy High School gets the bulk of its funds. The Media Academy is marking its 25th year, and director Michael Jackson has been at the school for all of them. Although his funding is the most secure – a tenuous commitment these days – Jackson says the state is moving too quickly to start new academies, especially when so many existing programs could use some help. When I met Reanna Garnsey two years ago, she was a 4.0 junior at Laguna Creek High School in the Elk Grove Unified School District. As a ninth grade student, her GPA was 0.8. Reanna cut school – a lot. What brought her back from the brink of dropping out was the Green Energy Technology Academy (GETA), a program that combines academics with real-world skills in alternative energy, including research, mentorships, and internships. Reanna’s transformation was so stunning that State Senate President pro Tem Darrell Steinberg asked her to testify before the Legislature in support of a bill to fund more of those programs. Her story may be on the far side of average, but programs like GETA, known as California Partnership Academies, are producing many success stories, according to a report released Tuesday by the State Department of Education. “A Profile of the California Partnership Academies 2009-2010″ by UC Berkeley’s Career Academy Support Network, found that high school seniors in academies have a 95 percent graduation rate, compared with 85 percent of seniors statewide; they’re more likely to attend college and more than half – 57 percent – graduate with the courses required for admission to the University of California or California State University, a whopping 21 percentage points above the statewide rate. Academies are programs located within comprehensive high school that focus on growing industries in their communities, such as alternative energy, health care, the arts, or building trades. They’re small, usually serving about 200 students in grades 10 through 12, who stay together for three years. At least half of the students must be considered at risk for dropping out or failing. School districts have to supply matching funds and develop partnerships with local business and industry. So I was surprised to receive an email last week from Eric Johnson, the Laguna Creek teacher who started GETA, asking for help because the program’s funding runs out at the end of this academic year. “This means that we must now go through the entire grant application process to secure future funding,” wrote Johnson in an appeal to business partners to write letters of support to help GETA make its case for new funding from the state. 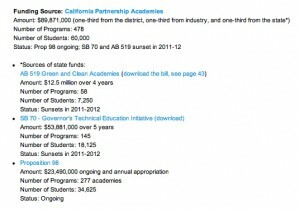 Funding Sources for California Partnership Academies (source: Career Academy Support Network); click to enlarge. million a year through 2017, from the State Energy Resources Conservation and Development Commission, to pay for about 100 academies focused on green energy and technology. Despite its successes, GETA will have to reapply for the money, going up against every school that decides to enter the pool. “No question that not only do we have to expand what we’re doing, but before we can expand we have to keep what exists and what is successful intact,” said Steinberg during Tuesday’s telephone conference call. Keeping the doors open at all 200 academies will cost about $15 million. Some of that money would be available if lawmakers reauthorize SB 70, the bill that initially established the California Partnership Program. Steinberg said his office will be working on that during the next session. Still, partnership academies aren’t exactly sweeping the state. There are just under 48,500 students enrolled in the programs – about 3 percent of all students in grades 10-12, raising questions about their cost effectiveness. 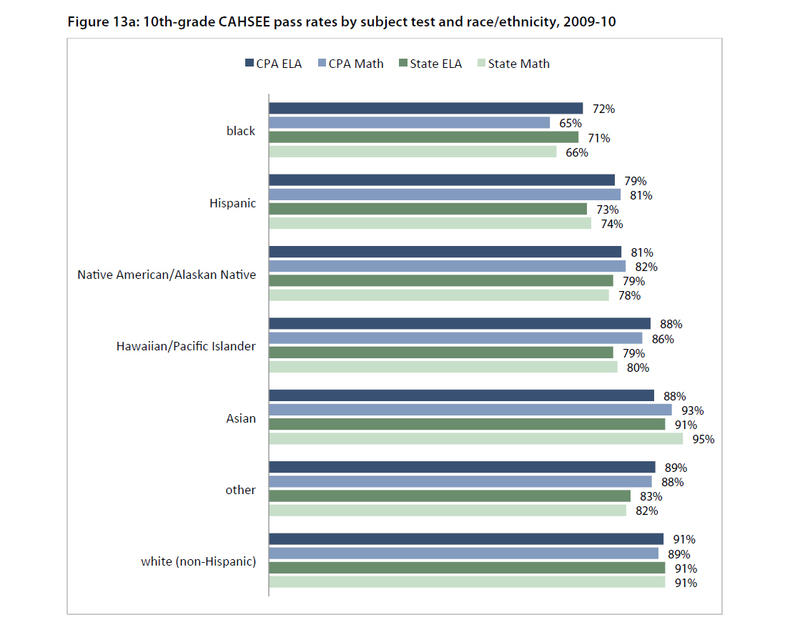 Exit exam pass rates by race & ethncity (source: Career Academy Support Network); click to enlarge. What’s more, the overall gains seem to have slowed a bit. 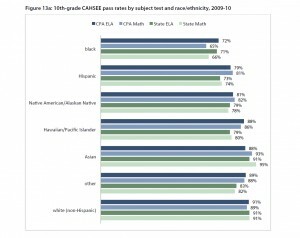 Back in 2004-05, 80 percent of academy tenth graders passed the California High School Exit Exam in math, compared to 74 percent for all other tenth graders. The gap was even larger for the English language arts section of the exam. But by 2009-10, statewide pass rates increased to within 1 or 2 percentage points of academy students, whose rates barely changed. But that’s not the case for tenth grade Hispanic students in academies, who outperformed all other Hispanic sophomores in math and English language arts. The report also found that both African American and Hispanic seniors in academies graduated at significantly higher rates than those not in academies – 16 percent higher for African Americans and 14 percent higher for Hispanics. Create a Commission on Educator Excellence to jump-start policies on teacher and principal development; increase the adoption of digital materials; incorporate phys ed into a school’s API score. These are among dozens of recommendations in Superintendent Tom Torlakson’s “Blueprint for Great Schools,” a 25-page report released on Tuesday. Seven months in the making, it’s the product of his massive transition team, 59 advisers consisting of parents, business leaders, teachers, academicians, and school administrators. 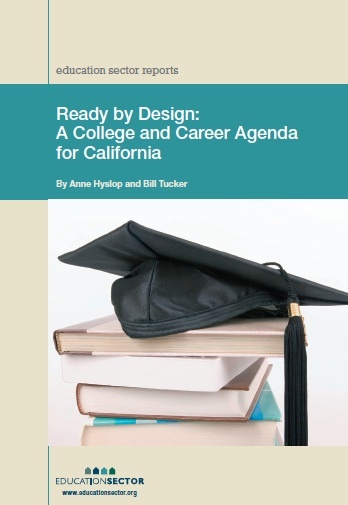 Sweeping in its scope, the report makes a number of reasonable suggestions without hard edges – a reflection of Torlakson’s consensus style, temperament, and interests: teacher training, career-technical education, and early childhood education. In California’s fractured division of K-12 responsibilities, Torlakson doesn’t set policy; the State Board does. But his priorities also match up well with those of Gov. Jerry Brown, State Board President Michael Kirst, who chaired Torlakson’s school finance subcommittee, and key Democratic legislators, Senate President pro Tem Darrell Steinberg in particular. And, from all appearances, Torlakson and the State Board are making great efforts to work together. So there’s a chance that some of the report’s proposals – especially those not requiring substantial new money – may gain traction. The report also has the weight of the transition team’s two co-chairs, Stanford University School of Education Professor Linda Darling-Hammond and David Rattray, senior vice president of education and workforce development for the L.A. Area Chamber of Commerce. Budget cuts, combined with flexible spending, have shrunk teacher and administrator development and training programs. California has cut or malnourished model programs – like BTSA (Beginning Teacher Support and Assessment), Peer Assistance and Review (PAR) – for mentoring underperforming teachers, as well as School Leadership Academies. There is little collaboration time left for teachers. The Commission on Educator Excellence will focus on reviving some of these programs. Darling-Hammond, who chaired the educator quality subcommittee and has agreed to serve on the State Commission on Teacher Credentialing, champions another idea which the report says could “dramatically strengthen educator preparation”: enforcing the new performance assessments that all beginning teachers must take and using the results to measure the quality of teacher preparation programs. Integrating career technical education or “linked learning” into high school while better aligning K-12 courses with college and career expectations is a focus of the report. It urges removing the constraints that A-G – the courses required for admission to a CSU or UC school – and standardized tests have imposed in discouraging students to take, and schools to offer, courses in engineering, biotechnology, and technology. They are electives, not sciences, under A-G. It also recommends removing barriers preventing high school students from taking community college courses and – listen up, Jerry Brown – urges linking CALPADS, the K-12 student database, with higher education and workforce databases to track students’ records of success. Use emerging technologies for more efficient operations and improvements in instruction; revise regulations on minimum instruction time to capture efficiency. A Harvard Graduate School of Education report that urges moving away from a “college for all” approach to education reform has created a coast-to-coast roiling debate. “Pathways to Prosperity: Meeting the Challenge of Preparing Young Americans for the 21st Century” calls for a much broader approach to secondary education than a college-prep curriculum for a four-year university. It should emphasize multiple career and college pathways in high school leading to associate’s degrees and job skills certificates. An estimated two-thirds of jobs that will be created over the next decade will require some education beyond high school, notes the report. But half of these will demand less than an associate’s degree, for jobs in nursing, commercial construction, health-care technology and manufacturing that demand technical skills. More than a quarter of people holding licenses short of an associate’s degree earn more than the average person with a bachelor’s degree. Meanwhile, only 40 percent of young people who start college attain a bachelor’s or associate’s degree by their mid-20s. Most have little to show but debt. The report is being praised as a dose of reality by business organizations and career and technical education advocates – especially vocational teachers, who have seen their ranks depleted as middle and high schools have focused on core academic subjects. But some advocates of universal college-prep curriculums, like the A-G requirements for admission to CSU and UC campuses, worry about taking a step backward to tracking of low-income, minority kids and giving up prematurely on a movement committed to higher achievement for all children. “Here comes a report that wrongly suggests to them that all of the work they’ve put into this effort has been for naught,” said Kati Hancock, president of Washington-based The Education Trust. There is middle ground between those advocating A-G as a default curriculum, including my employer, Silicon Valley Education Foundation, and the old guard at regional centers, offering stand-alone vocational courses. In California, it is 500 partnership academies, schools within larger schools combining academics, technical training and counseling, and an ambitious plan by ConnectEd California to expand the multiple-pathways approach to college and career training to whole districts. The report highlights this “linked learning initiative,” and Hancock, while noncommittal, says Ed Trust is examining it. Academic courses in the partnership academies are aligned with A to G requirements. The challenge is to avoid reverting to tracking: steering low-income and minority children into non-college-bound classes, a prevalent past practice that continues. In California, the goal would remain for all students to complete Algebra I by the end of eighth or, at latest, ninth grade, to be at grade level in English, and to take courses that by the end of sophomore year leave open the option of going on to a four-year college. The state must back up that commitment by extending the school day, attracting the best teachers to underperforming schools, and providing them extra resources, says Manny Barbara, vice president of the Silicon Valley Education Foundation. “Attention to jobs and careers cannot be an excuse to give up on equity,” he says. If there were more money, there would be opportunities to expand middle school career education and counseling, apprenticeships in high school, and multiple pathways. But for now, there are only cuts. In some districts, vocational courses like wood shop and electives are being eliminated to make room for catchup courses in English or math. On top of that, career and technical education is “on the outside of the three drivers of K-12 education: what is required, what is funded, and what is tested. CTE is not part of high school course mandates or testing,” so it remains vulnerable, says attorney Fred Jones, spokesman for the California Business Education Association. The implication for California is, in the near run, to protect partnership academies and career and technical education from further budget cuts, says Gary Hoachlander, president of ConnectEd. When there eventually is additional funding, he says, a priority should be to expand the high school day from six periods to seven or eight. Then, he says, students will be able to do job shadowing and engage in experiences in real-world learning with time for taking other electives and repeating a course if necessary. “It wouldn’t come down to pitting the arts against CTE,” he says. The Center for Advanced Research and Technology in Clovis is an impressive place, a model facility for career and technical education that other school districts will recreate one day when they once again have money. Serving 1,300 students in Clovis and Fresno, CART blends college prep academics with technical skills for juniors and seniors who work half-days in 13 labs. They include biomedical engineering, forensic science, engineering, advanced communications, and global dynamics. CART teachers and administrators have had testimonials and anecdotal evidence from employers and students who said they found the real-world exposure to college and careers challenging and inspiring. Now, there is additional data to support these assumptions. A seven-year study showed that a larger proportion of CART graduates go on to community college than high school graduates statewide, and also significantly larger numbers than similarly matched peers in Clovis and Fresno. To a lesser extent, the comparison also holds for graduates who go on to a four-year university. Overall, 72 percent of CART graduates since 2002-03 went on to community college, compared with 29 percent of high school graduates statewide. That comparison held up for all demographic groups, including African American graduates (68 to 32 percent) and Hispanics (73 to 32 percent). More pertinent was the peer comparison, matching students in CART with juniors and seniors in the district with similar demographics, parent education levels, and scores on standardized tests; 71 percent of CART grads enrolled in community college, compared with 60 percent of their peers. The difference held a year later, with 62 percent of CART graduates still enrolled in community college, compared with 51 percent of non-CART graduates. Students solder at a robotics lat at CART (courtesy of CART). CART courses are A-G aligned, fulfilling an admission requirement to a CSU or UC campus. The percentage of CART graduates going on to a four-year university was 23 percent, compared with 21 percent of non-CART graduates. The study didn’t tabulate the percentage of students who chose community college to save money and then transferred to UC or CSU after two years. The study was done by California Partnership for Achieving Student Success, with funding by the James Irvine Foundation, a key promoter of the concept of linked learning. This strategy prepares students for work careers or college through project-based, technical applications within career pathways. Irvine has funded district-wide linked learning planning in a dozen districts. CART, serving as a regional facility for students from 13 high schools, differs from career academies – small schools within a school that provide three-year programs in a career pathway, along with internships and academic support. Career academies also have increased college-going rates, especially for students at risk, by creating a small-school community. Devin Blizzard, CEO of CART, said that CART, too, has been able to provide students with a small learning community. The 100 students in each of the 13 career pathways study and work together daily in a three-hour interdisciplinary block, team-taught by three teachers. 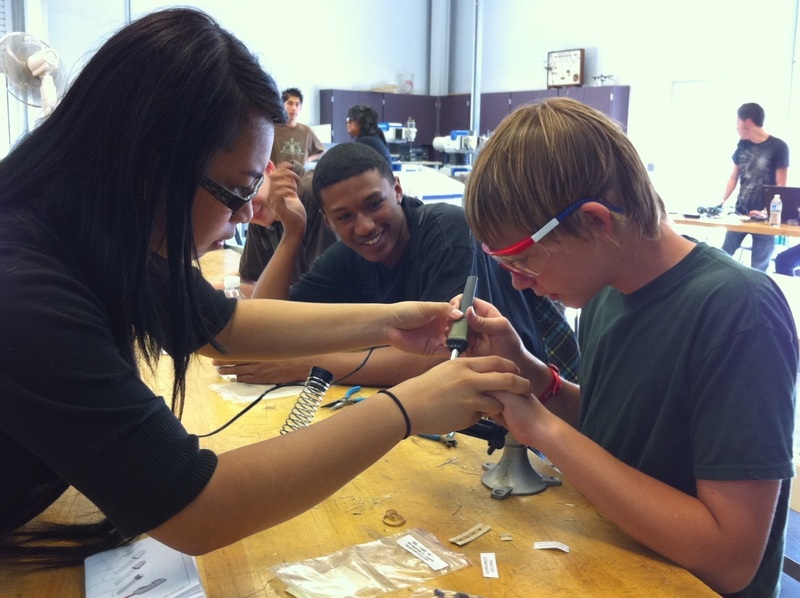 They break into small groups for hands-on projects; about 40 percent have internships. CART has equipment that few individual high schools can afford, like polymerase chain-reaction machines and a spectrometer in the $1.5 million lab for the biomedical program that opened last fall. The psychology lab is team-taught by a chemistry, English, and neuroscience teacher (the only California program with a teacher who majored in neuroscience, according to Blizzard). While unemployment rates remain stubbornly high, there is another grim reality we cannot ignore. Figures released last month by the California Dept. of Education indicate that more than one in five students – 22 percent – in the Mt. Diablo Unified School District drop out of school, matching that of the state as a whole. As a parent with three children in the district, I find this statistic alarming. As a businessman, I know this data is indicative of the trouble companies have in finding highly skilled workers to fill jobs. As a local policymaker, I am proud to say that there are efforts under way within the district and throughout California to address both the dropout crisis and the challenge of preparing all of our youth for the modern workforce. According to the national business leader organization America’s Edge, employers say that even applicants with a four-year college degree are entering the workforce underprepared. So it is no surprise that those who are coming straight out of high school are even less prepared for careers in today’s knowledge-based economy. Dropouts have even fewer options and, unfortunately, many turn to crime, which further burdens our economy and depletes our local resources. Not every high school student must go on to a four-year university, but every student should have the opportunity to do so. Every student should also be prepared for the world beyond school. With or without a degree, job seekers must enter the workforce as communicators, collaborators, and critical thinkers. In an effort to achieve these goals and ensure that public education in the 21st century is relevant, schools around the state have turned to a model that links academics with career-technical education and work-based learning opportunities. Recently, I visited the Architecture, Construction, Manufacturing and Engineering (ACME) Academy at Mt. Diablo High School in Concord. The 156 students in the program receive their core subjects – English, math, and science – through the lens of this particular industry sector, which helps keep them interested and engaged in school. The integration and cross-subject projects allow them to see the connection between what they are learning in school and how it applies to the real world. The students I spoke to were enthusiastic about the work they were doing. They relished the challenges of developing and executing their work plans. They were confident and proud of their accomplishments. It was clear they were applying traditional high school subjects in a way that resonated with them and reinforced their pursuits. It was inspiring to see kids having fun while actively learning. The ACME Academy is supported by partnerships with Chevron, USS-POSCO Industries, the Contra Costa Water District, and the local carpenters, electricians, mechanics, and pipefitters unions, which provide industry support and curriculum guidance. But ACME is just one local example. Other Linked Learning academies are based on California’s biggest industries, such as information technology, health science, law, and hospitality – and each academy has its own industry partners. Research shows that these programs are working. Nationally, high-risk students who participate in career academies are far less likely to drop out of school. Participating students go on to work 12 percent more hours per week and earn 11 percent more money than students not in the programs. Yet too often, such academies are dismissed as niche programs intended for kids who cannot succeed in a mainstream, college-track curriculum. So-called “vocational education” has become a negative term, synonymous with underachievement and limitations. Such thinking is outdated and misses the critical point that our current approach is failing to produce the relevant, contemporary, and effective education all of our students need to become better prepared to compete in our global economy. As our times are new, we must think anew and look to new models and approaches to most effectively prepare all of our children for the world in which we live. Kish Rajan is a member of the Walnut Creek City Council and has been a mobile technology professional in the Bay Area since 1996.